After a restful night we arose to confront our second day in Scotland. We have decided to spend it in Edinburgh, Scotland’s capital city. We have visited the city before (see Glasgow 2012 – Day 8) but such single visits can never exhaust what a town like this has to offer. The map below shows the location of Edinburgh and our path there from Glasgow. Click for a live Google Map. As we are not having breakfast at the hotel, we went to the nearby branch of Caffè Nero for coffee and croissants. Then we crossed the road to Glasgow Central Station where we bought train tickets to Edinburgh. Not seeing Edinburgh on the departures board, we enquired and were advised to go to Queen Street Station where trains to Edinburgh were more frequent. 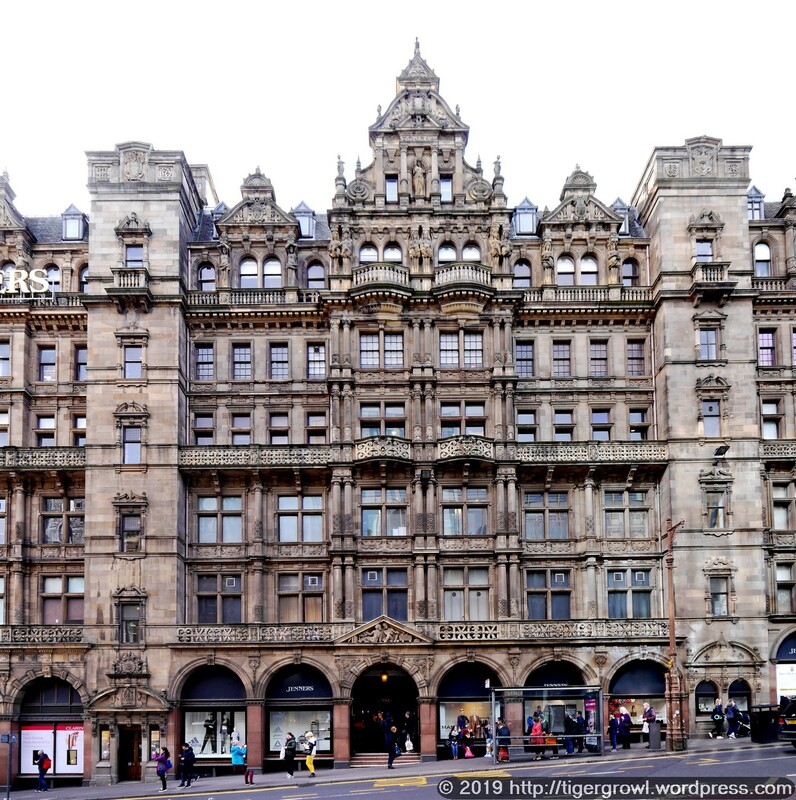 We walked to Queen Street and took an express train to Edinburgh Waverly. 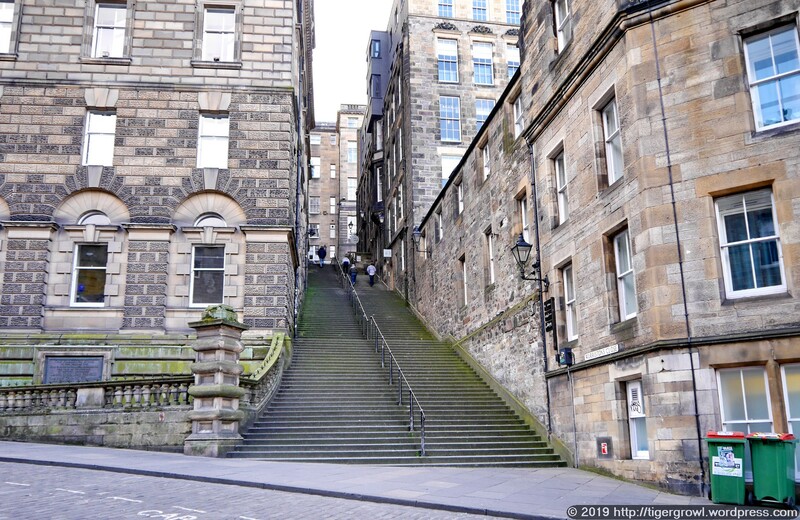 Edinburgh is an ancient town whose origins are no longer known. The modern name seems to derive from an earlier name, Eidyn, which may have been the name of the settlement itself or of a wider area. This was later combined with the Anglo-Saxon word burh, meaning ‘fortification’ or ‘fortified town’. The Gaelic name of the town, Dun Eideann, comes from Eidyn joined with dinon, British Celtic for ‘fortress’. 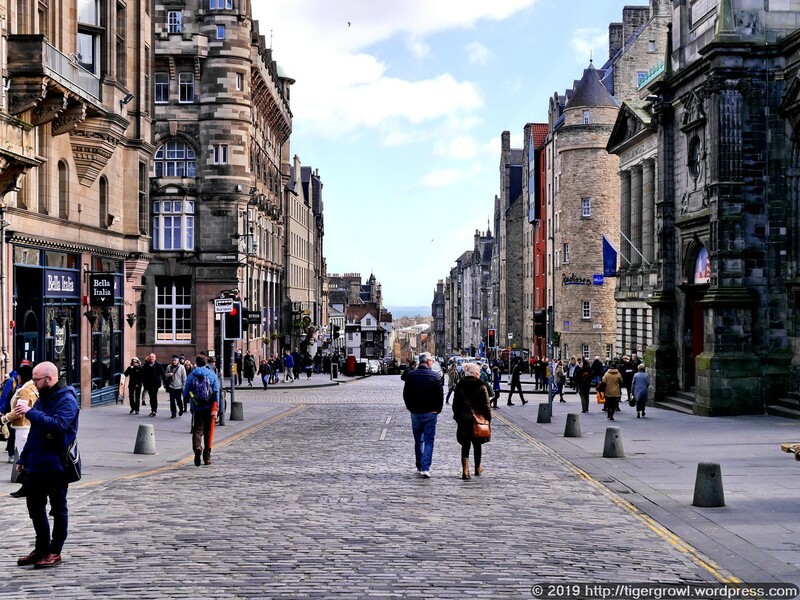 The meaning of Eidyn, which appears in combined forms in other placenames, is not known..
We did have a few places in mind to visit (more about those below) but, apart from that, we had no agenda and wandered more or less at random. This produced the photos shown below. From Edinburgh Waverly Station we trekked up the sloping Cockburn Street. It is lined with fine old houses but there are also lots of shops. Leading off it are a number of alleys or passages called ‘closes’. One of the most spectacular is this one, called Warristin Close, which consists of a broad staircase. It is named after Archibald Johnston, Lord Warrington. who lived there for a while. This is a narrower, perhaps more intimate ‘close’. 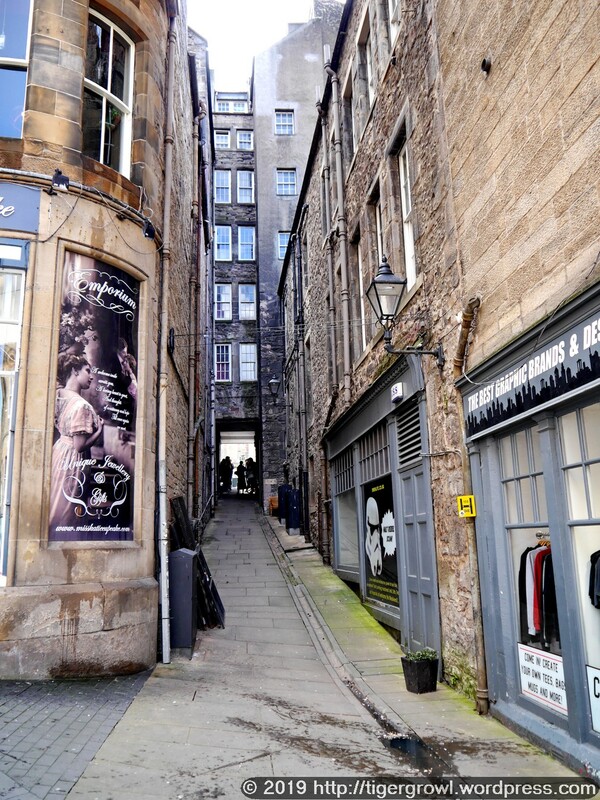 It is called Jackson’s Close, after one John Jackson whose family occupied a house here from about 1570 to about 1893 when they eventually sold it. The somewhat unpleasantly named Fleshmarket Close originally served the purpose you would guess from the name, being the site of the meat market. 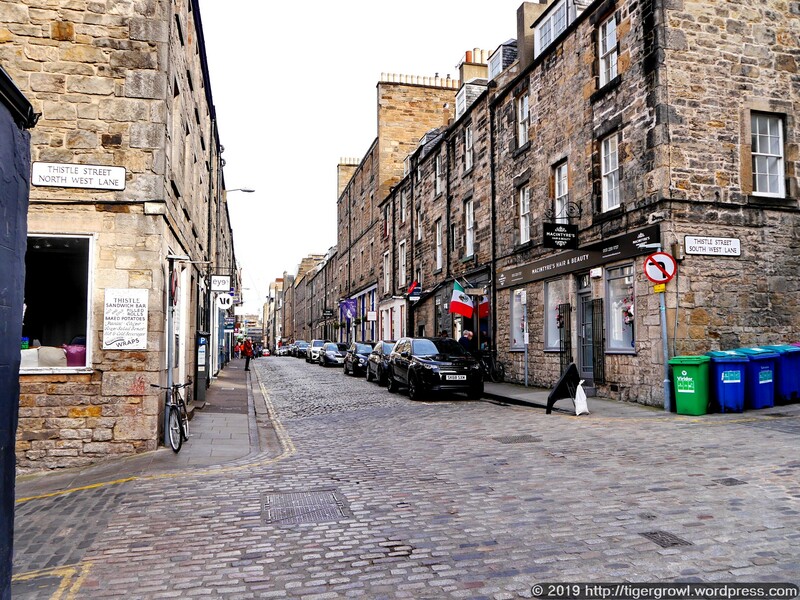 This close runs on both sides of Cockburn Street and the photo shows the southern section that leads from Cockburn Street into the High Street. 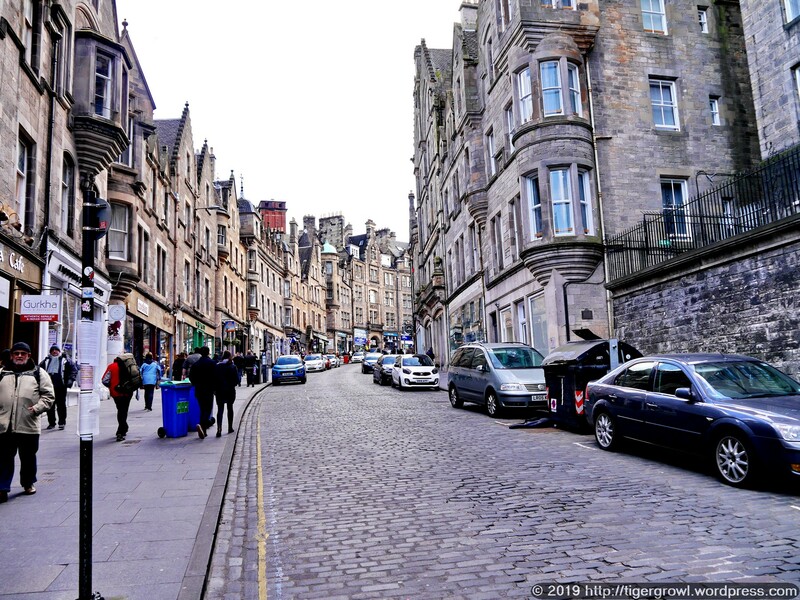 Shortly after the point shown above, Cockburn Street bends to the right and joins the High Street, delivering us roughly in the middle of a more or less straight succession of roads called the Royal Mile. This is the main tourist area as is rendered obvious by the crowds and the gaggles of people being shepherded about by tour guides. 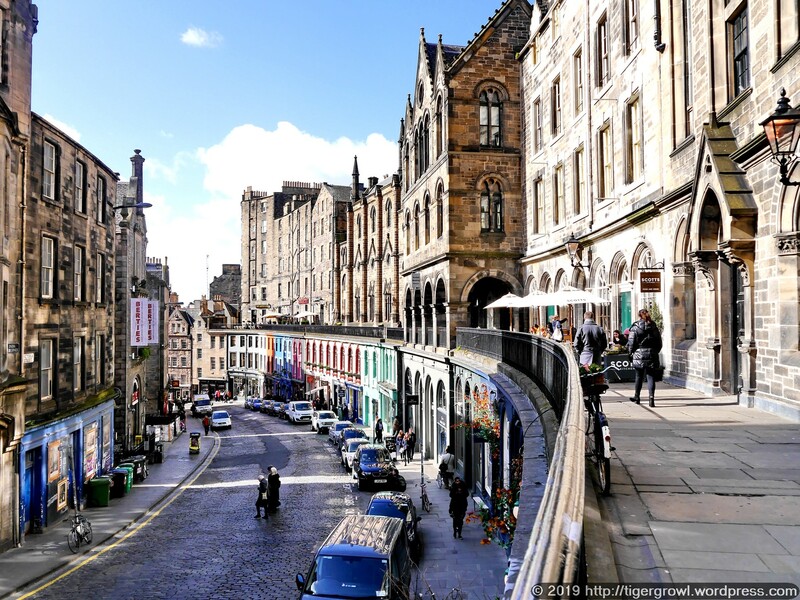 The High Street is broad and contains or links to some of Edinburgh’s most historic landmarks. 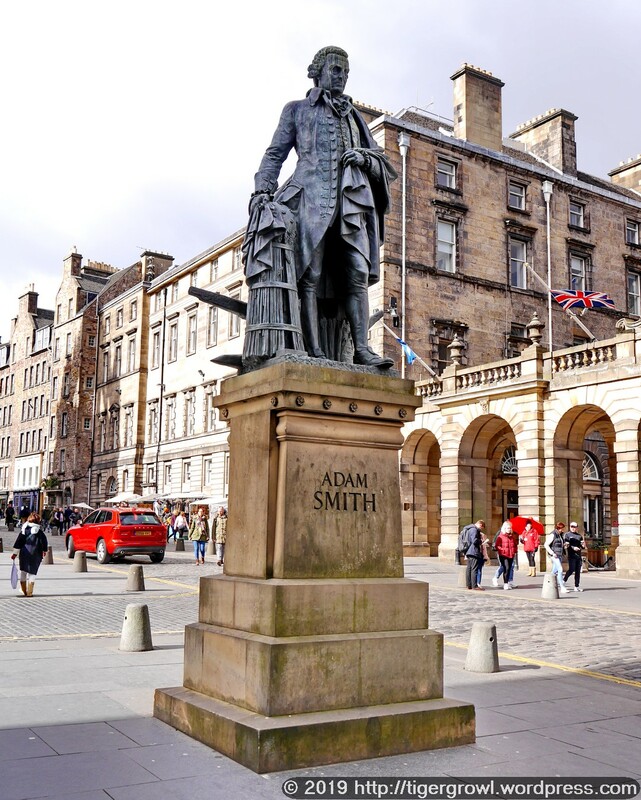 You would of course expect to find a memorial of some kind to Adam Smith (1723-90), given that he was born in Fife and spent most of his life in Scotland where he wrote and published his most famous opus, The Wealth of Nations. The statue is a bronze by Alexander Stoddart and was unveiled in 2008. Attracted by the handsome façade of the Edinburgh City Chambers, we enterred the courtyard to take a look. 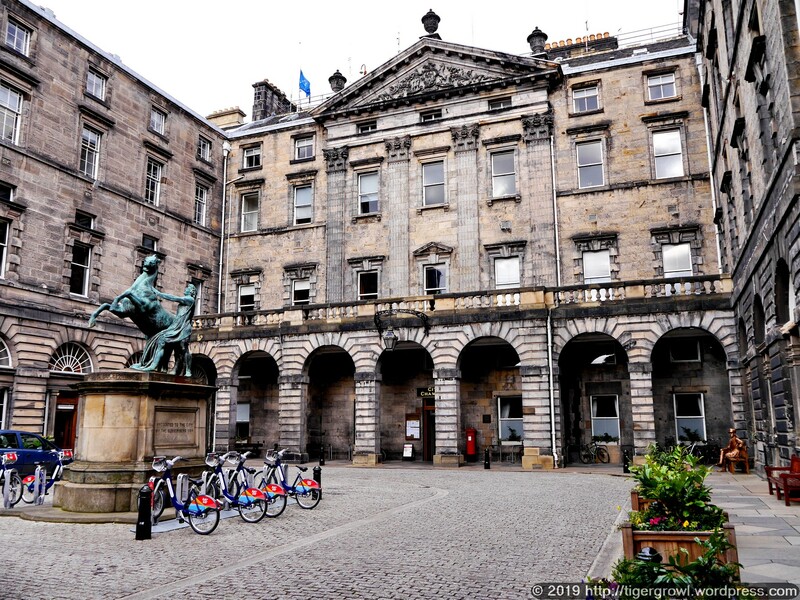 Built in 1753-61 as the Royal Exchange, the Chambers are now the home of the Edinburgh District Council. If you look carefully into the right far corner of the courtyard, you might be able to make out an interesting object. 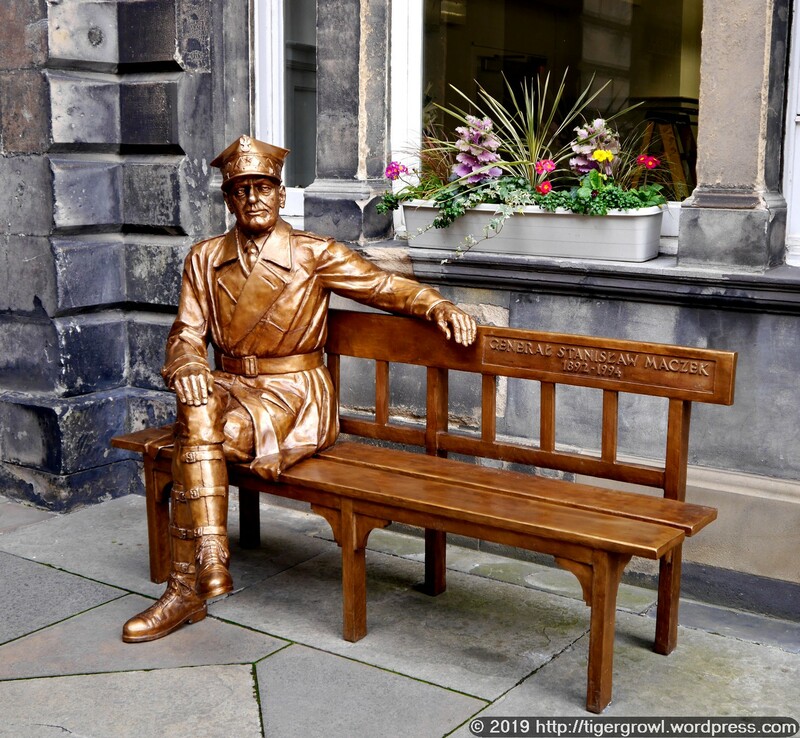 The statue, by Polish artist Bronislaw Krzysztof, represents the Polish war hero, General Stanislaw Maczek (1892-1994). You will find more about his history here and an account of the background to the creation of the memorial here. In case you are wondering, yes, I was persuaded, reluctantly, to have my photo taken sitting next to the general and, no, I am not going to show you the photo! 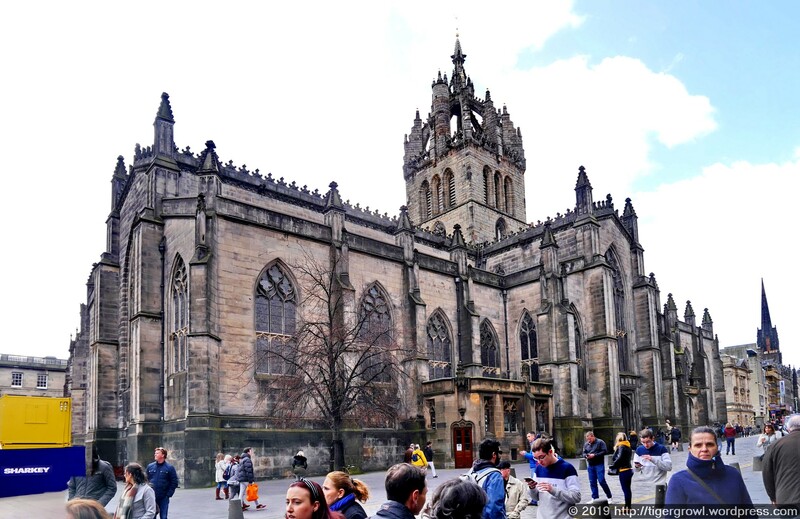 St Giles is also known as the High Kirk of Edinburgh and belongs to the Church of Scotland. Founded in the 12th century, the building underwent episodes of rebuilding and other vicissitudes until its last major restoration in Victorian Gothic style in 1872-84 by William Hay. An outline history of the Cathedral will be found here. We now came to the first of the three places that we had intended to visit. This was the pleasantly styled Victoria Street. It was built in 1829 to 1834 to plans by Thomas Hamilton in ‘Old Flemish’ style. 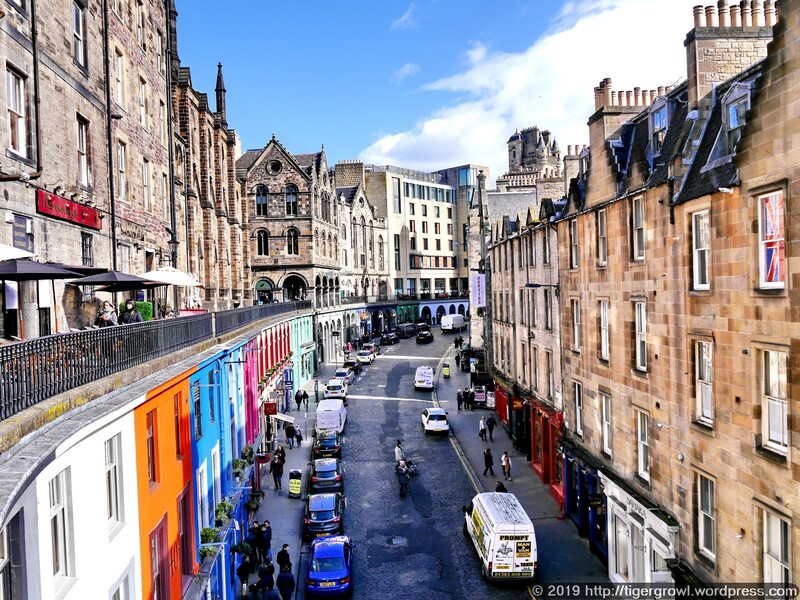 It was intended to enhance the Old Town and its gentle curve and colourful shopfronts make it one of Edinburgh’s most visited locations. We followed the raised walkway and then rejoined the street below via a staircase at one end. 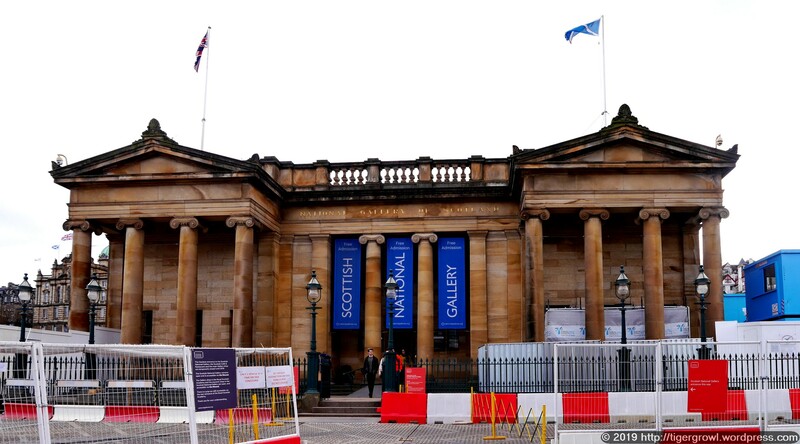 Our second must-see destination was the Scottish National Gallery. Of course, it is doing that institution far less than justice to pay a quick visit as we did today. One could dedicate a whole day to it alone. 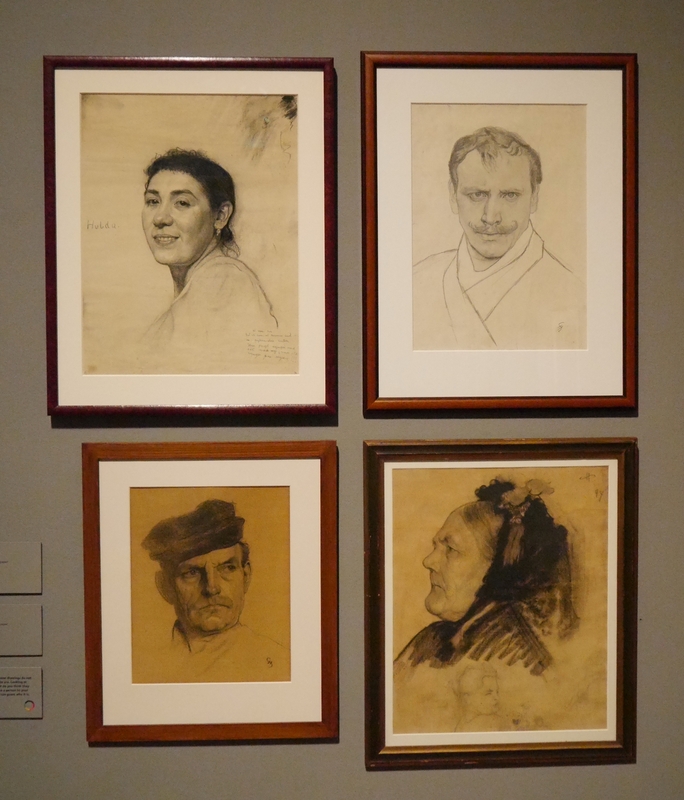 Equally, it is impossible to collect a ‘representative sample’ of the works held there and the three shown below were grabbed more or less at random. 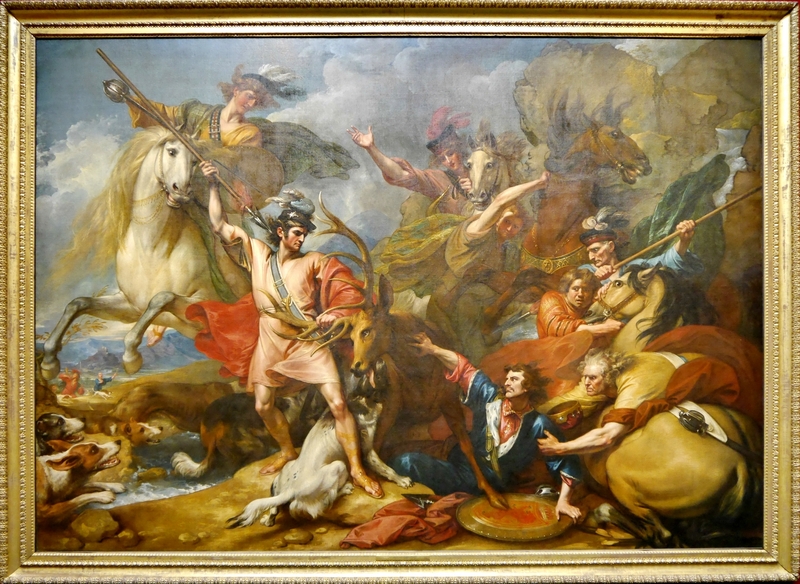 This romantically conceived and overly flamboyant scene was executed by the American painter Benjamin West (1738-1820) at the behest of Lord Seaforth, head of the Clan Mackenzie. It refers to an incident when the Irish exile, Colin Fitzgerald, during a hunting expedition with the Scottish King, allegedly saved the latter from injury by an enraged stag. Rewarded with lands by the King, Fitzgerald became the founder of Clan Mackenzie. Whatever the merits of the painting as a painting, this is a piece of shameless ego massage, according ‘heroic’ stature to the founder of the clan, and thus to his descendants. Of all the ways of flattering the ego, surely those that involve the suffering and pointless killing of animals are the most contemptible. This painting, ascribed only to the ‘Scottish School’ (i.e. 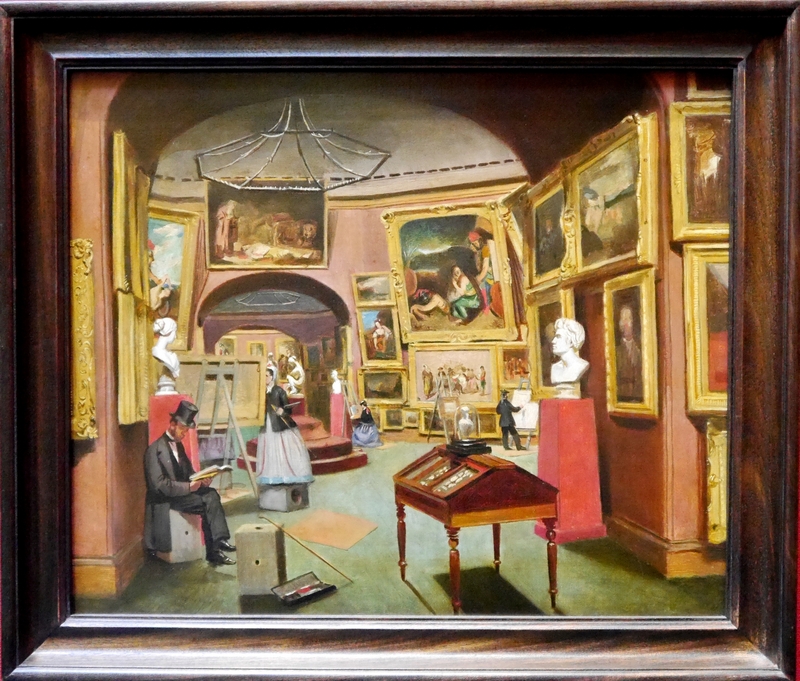 the artist is presumably unknown), gives us an intriguing glimpse of the gallery in which it is hung as that gallery appeared in the mid-19th century. For good measure, it includes some art students dutifully making copies of the masterpieces. As we left, I photographed the exterior of the gallery though it is not seen at lits best at present, the view cluttered with barriers and other accoutrements of building works. 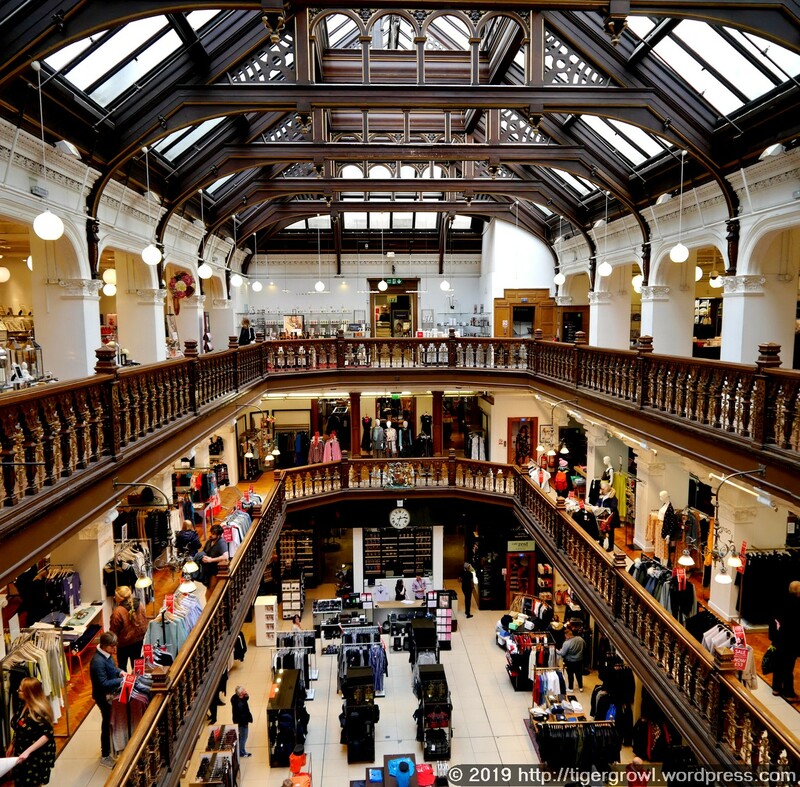 Known simply as Jenners, this department store has been a retail and social landmark in Edinburgh since it was first opened by its founder, Charles Jenner, in 1838. It was acquired by House of Fraser in 2005 and this year it was announced that it is to close as the company ‘restructures’. I suppose it is possible that someone might take it on as a going concern but that seems very unlikely in the present economic climate. Perhaps it will find a new destiny as an office or apartment block or a shopping centre, conserving the famous exterior if not the interior. We went for a look inside and I took a photo where the light well allows a view down several levels. While I have to admit that I rarely if ever buy from stores like this, I still find it sad that Jenners must close. We now went in search of our third chosen location. This took us away from the crowded tourist areas into some quieter streets. One of these was Thistle Street. We were looking for number 25c. 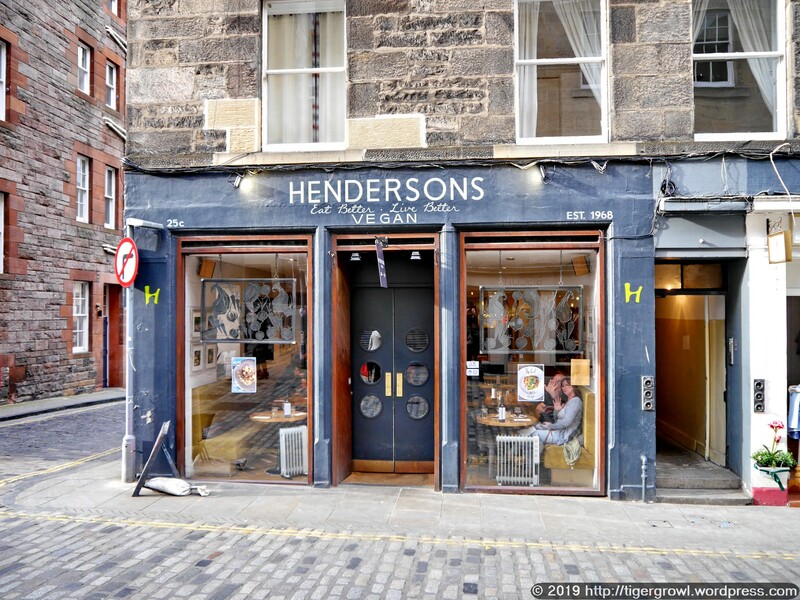 And here it is – Henderson’s Vegan Restaurant! Time was when if you found a vegetarian – never mind vegan – restaurant, you would be pretty much on your own there. This is no longer the case. The vegetarian and vegan lifestyles are catching on and restaurants are proliferating. Henderson’s was virtually full when we arrived. ‘Do you have a reservation?’ they asked. We didn’t but they kindly managed to fit us in. Several customers who came in after us were not so lucky. So what special dish do you eat when you go to Scotland? Why, haggis, of course! If you are not vegetarian or have become so only recently, you may not be aware that there are vegetarian and vegan versions of this primordial Scottish dish. In that case, you may like to try it if it is on the menu of your favourite eating place. It was on the menu at Henderson’s and so we took it. After lunch, we went for another walk but time was getting on and we were beginning to feel that we had seen the best of the day. We found ourselves approaching a park or garden called St Andrew’s Square. In the centre of it stands a column, lofty enough to be visible from many streets away. A tall, straight column with a human figure on top can only remind the observer of Nelson’s column although this one is roughly a third shorter (42.6m as opposed to 52m). The interesting thing about such a prominent monument is that the man that it celebrates was by no means univerally liked or approved of. Henry Dundas, 1st Viscount Melville (1742-1811) was a politican, sometime MP for Midlothian and Minister for War. He opposed the abolition of the slave trade and was accused of misuse of public funds, though never found guilty. How could such a man come to have such a prominent monument? It seems that he was popular among the armed forces, many of whose members contributed to the subscription for the monument, and he enjoyed the good will of those to whom he had shown favour. A fuller description of his life and activities will be found on The Melville Monument. 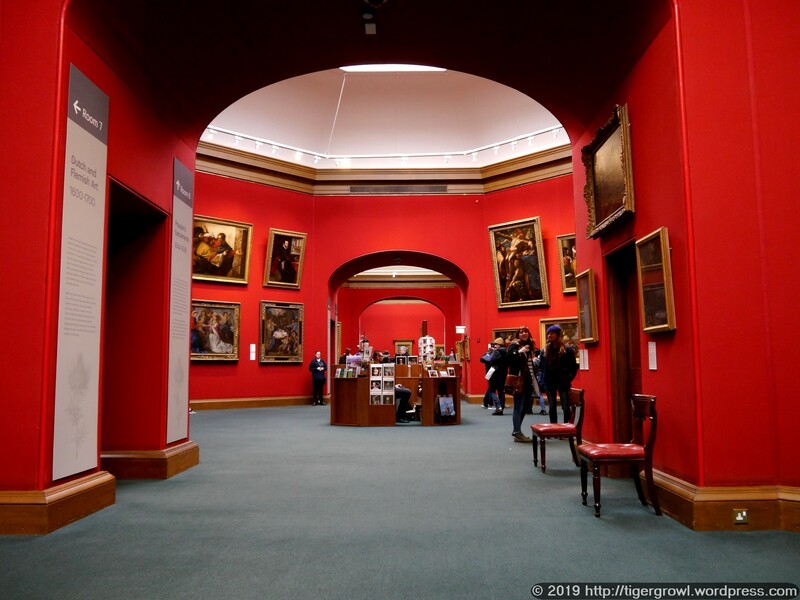 There was still much more to see in Edinburgh but we felt that we had done enough for one day and Edinburgh will no doubt still be there if we decide to pay it another visit in the future. For now, we turned our steps towards Edinburgh Waverly Station and took a train back to Glasgow. 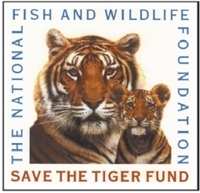 Copyright © 2019 SilverTiger, https://tigergrowl.wordpress.com, All rights reserved. To celebrate Tigger’s birthday, we are spending a few days in the beautiful Scottish city of Glasgow. The map below shows its location relative to London. You can click on this map to see a live Google Map of the same area. Glasgow is one of our favourite cities and we have visited it three times already: see Glasgow 2008, Glasgow 2012 and Glasgow 2017. 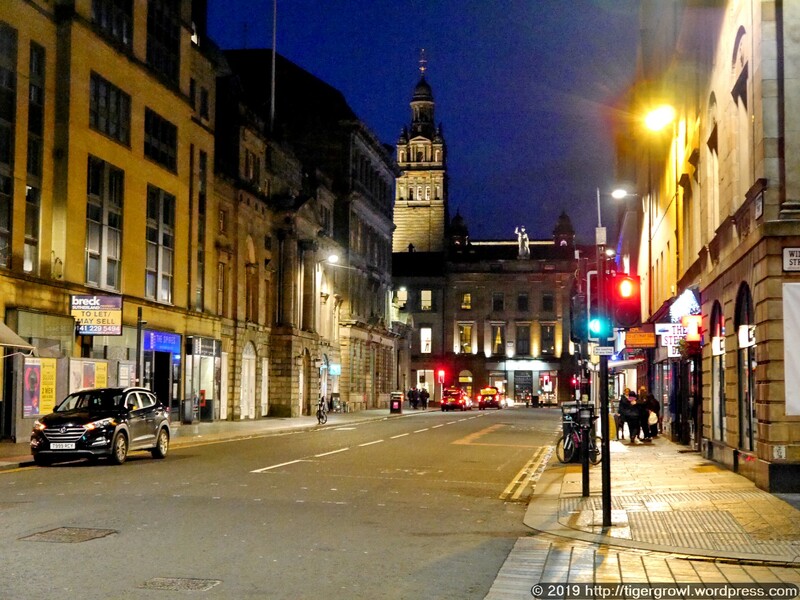 Glasgow is a Scottish city but it has its own character which makes it unique. The etymology of Glasgow is uncertain. 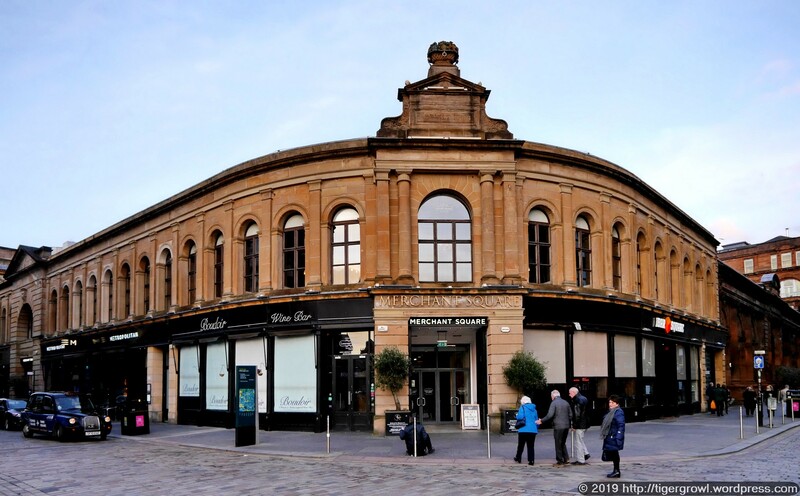 The settlement was probably founded in the 6th century when the area formed part of the Kingdom of Strathclyde and the king, Rhydderch Hael, invited St Kentigern, also known as St Mungo, to build a church and set up a community there. According to the most frequently cited etymology, the name is formed of two words in the Cumbric Celtic language, glas, meaning ‘green’, and cau, meaning ‘basin’ or ‘hollow’. An alternative etymology takes the name Glasgu, which is attested in the 12th century, and derives the second element from cu, meaning ‘dear’ in Welsh to interpret the name as ‘Dear Green (Place)’. According to The Old North, this ‘is probably folk etymology based on the early form Glasgu (12C), which gives modern Gaelic Glaschu.’ Whatever the etymological validity of this name, it has become widely popular and ‘Dear Green Place’ is now a commonly cited pseudonym for Glasgow. The journey is quite a long one (at least by British standards), taking about five-and-a-half hours from London Euston to Glasgow Central. That is assuming that the journey went to plan which, unfortunately, it did not. We left home in plenty of time in order not to have to rush and to be able to have breakfast at the station while waiting for the train. At Euston station, we breakfasted in Café Rouge and then betook ourselves to Caffè Nero, intending to wait there until it was time to catch the 9:43 Glasgow train. Fortunately for us, Nero has a live train departures board. Casually glancing at this, Tigger saw with a shock that our train had been cancelled! It was now about 9:15 so we hurried into the station to find someone who could advise us what to do. The advice was short: go to King’s Cross and take a train there. Fortunately, King’s Cross is only a couple of stops from Euston by bus and it didn’t take us long to transfer. Enquiring what to do next, we were told to take the Edinburgh train that was about to depart. We hurried aboard and found it nearly full. We had reserved seats on the Glasgow train but these were of course not valid on this train. We found a couple of seats that were reserved from Newark and sat in those for the time being. Perhaps the seats’ owners would fail to appear. No such luck: at Newark we had to give up the seats and find somewhere else to sit. Tigger found a couple of seats that were reserved but unoccupied and we took those. This time we were lucky: no one claimed the seats and we could remain in them until we reached Edinburgh. At Edinburgh, we transferred to a local train for Glasgow. There is a slow train that goes to Glasgow Central and a fast train that goes to Glasgow Queen Street. 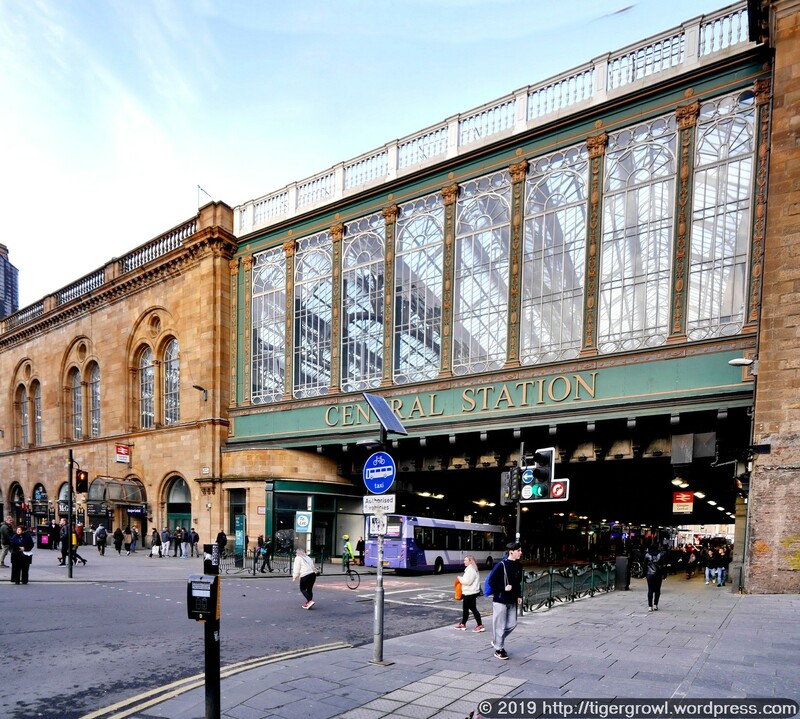 The Glasgow Central train would be more convenient as our hotel is near that stationy whereas the Queen Street train would convey us there sooner but require us to drag our bags a longer distance to the hotel. In the end we chose the fast train. Our room is ’modern functional’ and quite small but the bed seems comfortable and there are all the usual facilities, including plenty of power points. There is a double socket either side of the bed so we can recharge our devices without using our extra-long cables which we always bring just in case. We did a minimum of unpacking and then made tea. It’s strange how sitting on a train for five or so hours can be tiring but it was good to relax and rest. In the evening we went out for a stroll and to find somewhere to have supper. 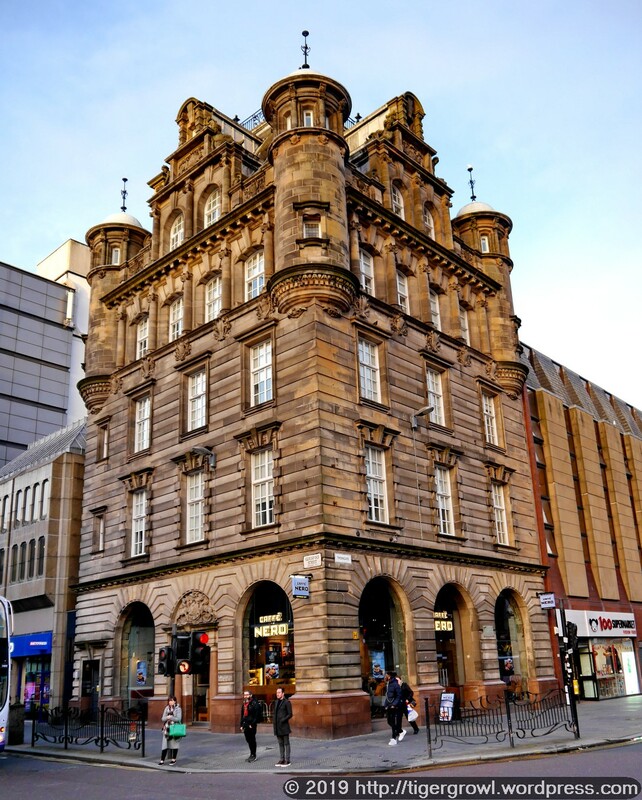 We eventually chose a South Indian restaurant called Dahkin in the Merchant City district. 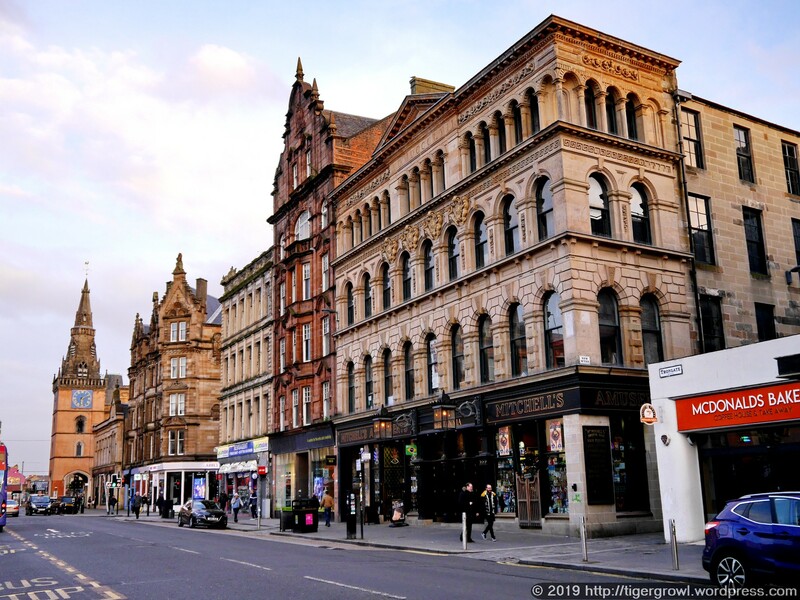 What is now called Merchant City was once the business sector and contains warehouses and office buildings that are no longer required for their original purpose. 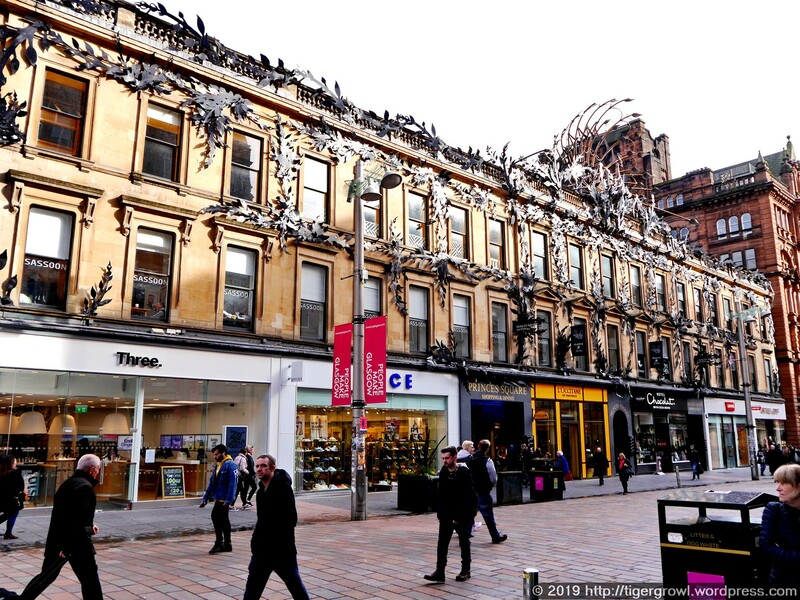 So Merchant City is being redeveloped as an area for the arts, culture and entertainment. After our meal at the Dahkin, we took a stroll through the city, renewing our acquaintance with it and taking a few photos. I include some of these below. 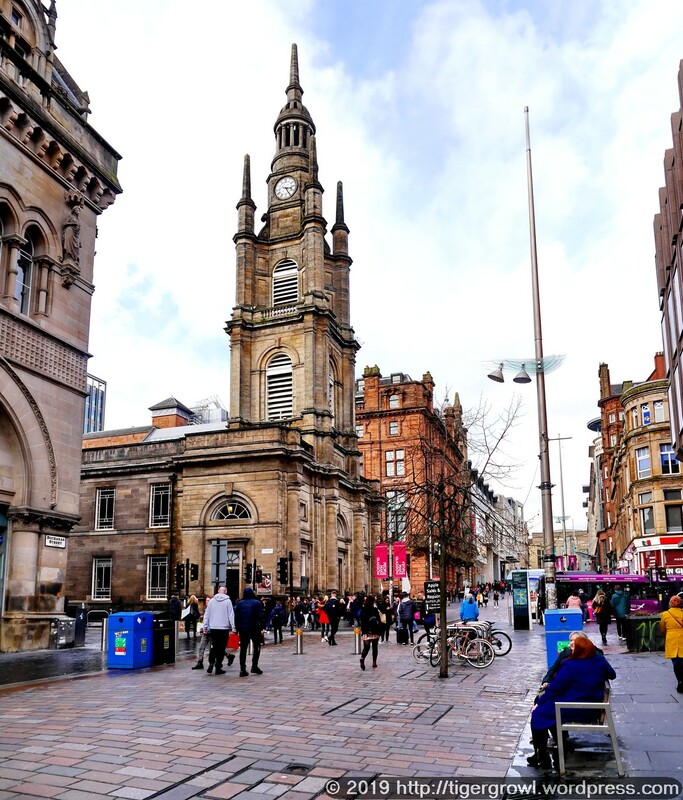 In this picture we are looking along Buchanan Street towards St George’s Tron Church. This was built in 1808 and still functions as a church, unlike several others that have found new destinies outside religion. 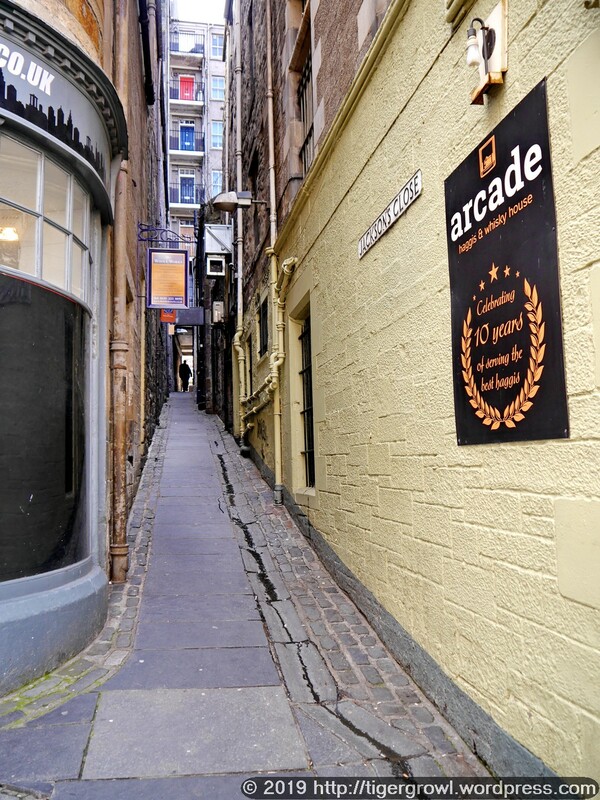 The word Tron in the name refers to Trongate, the name of one of Gasgow’s medieval streets and, to a certain extent, of the area around it. Trongate was at the dentre on the ancient city which has, of course, expanded considerably since then. 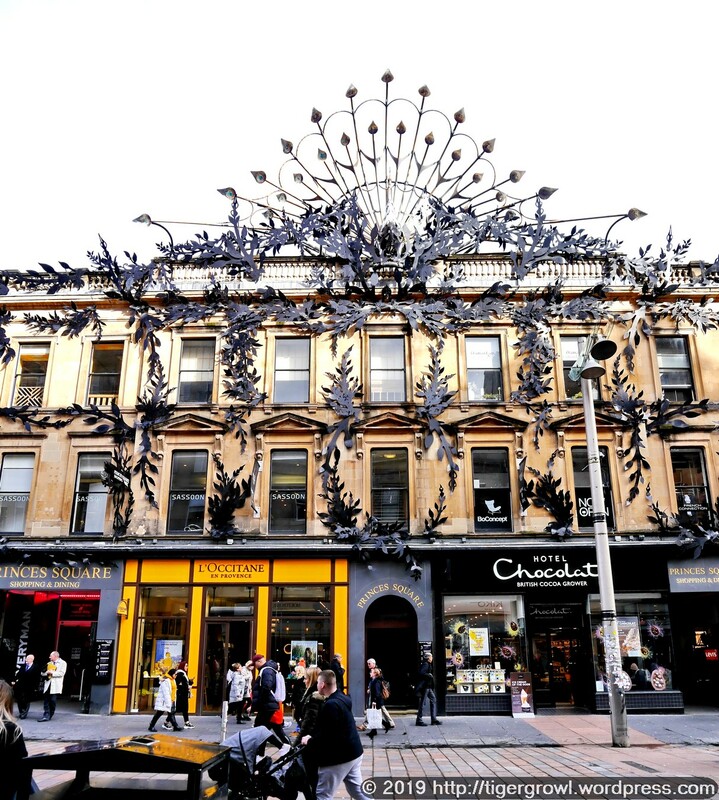 The amazing Art Nouveau Peaock is a massive work of art in metal positioned on the front of the Princes Square Shopping Centre. The building itself dates from 1840 but was converted to its modern use in 1986. The Peacock was installed as part of this work. The combination of early Victorian architecture and Art Nouveau-inspired metal work certainly gives one pause for reflection! Glasgow’s main station, Glasgow Central, is famous for its enxtensive bridge which spans Argyle Street. In turn, the bridge is famous for its nickname, the Hielanman’s Umbrella (the Highland Man’s Umbrella). I explained the origin of this name in my account of our visit to Glasgow in 2017 and you can see it by clicking here. 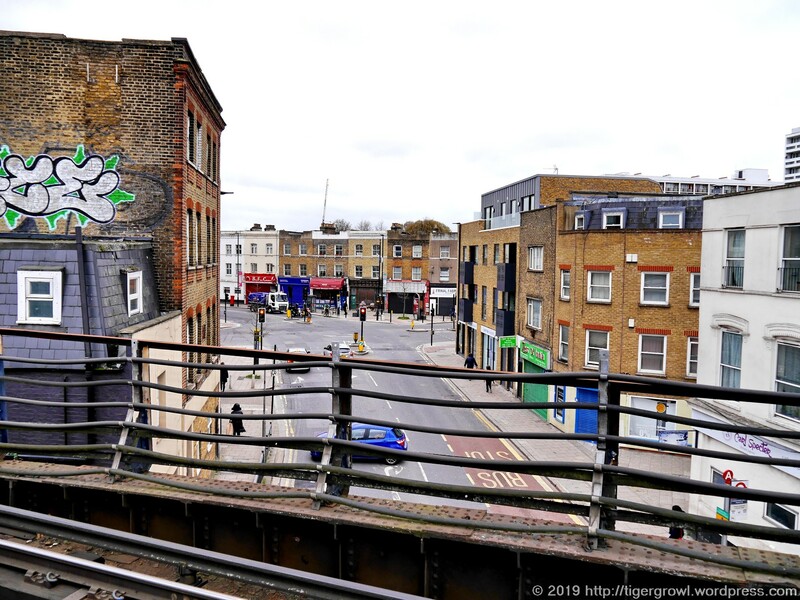 The area under the bridge is quite dark, needing to be lit by artificial llighting and efforts are being made to enliven it by encouraging retail and other businesses to set up there. 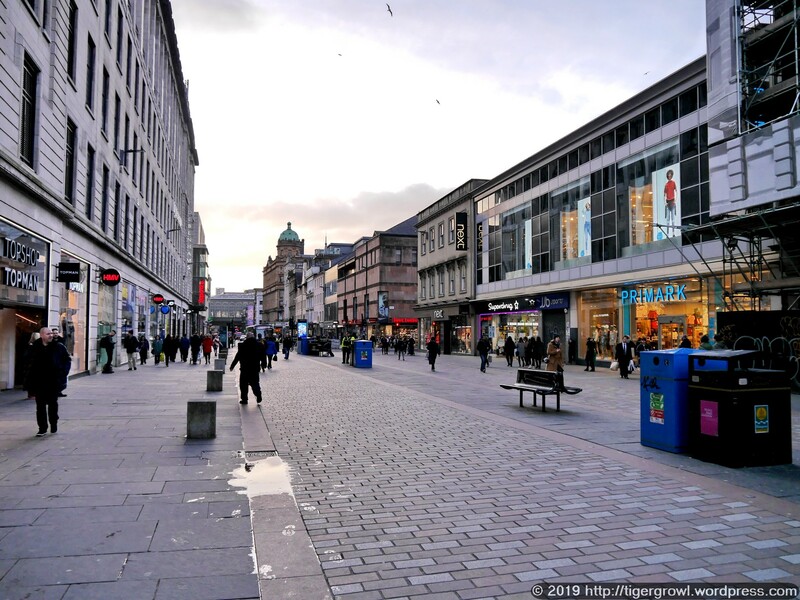 This is just one section of Argyle Street which is quite long and is one of Glasgow’s main shopping streets. Many of the ‘usual suspects’ (well known trading brands) are present and may in fact have several branches in various parts of the city. If my caption for this building is somewhat vague it is because I do not know anything about it other than what is visible from the street. No doubt Victorian, it seems to me a typical example of the beautifully styled buildings which abound in this city. I am always intrigued by buildings with turrets as I have a hankering to live in one, an ambition as yet to be fulfilled! This one is inhabited on the ground floor by a branch of Caffè Nero. This chain of coffee shops has a number of branches in the city, most of which we have visited at some time or other, mainly for our usual breakfast of croissants and coffee. In this view we are looking along Trongate towards another famous landmark. 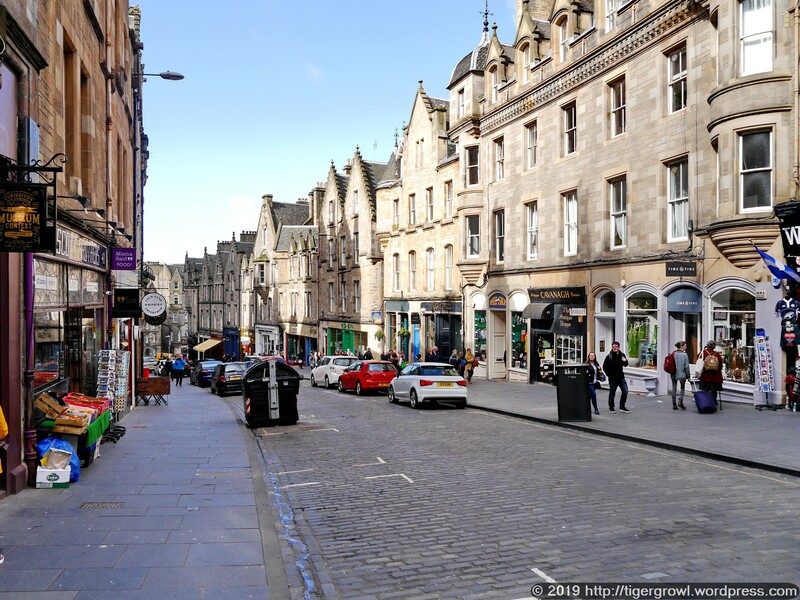 The name Trongate derives from gate in its common northern British meaning of ‘road’, ‘street’ or ‘way’ combined with tron, a Scots word for a steelyard or weighing machine such as were often sited in or near markets. See, for example, the Dictionary of the Scots Language. On the left, glowing pink in the evening light, is the Tron Steeple with its clock. The Steeple was built in 1637 as part of the Collegiate Church of St Mary and St. Anne. The church was unfortunatelyburned down by drunken members of the Hellfire Club in 1793 and only the Steeple survived. A replacement church, designed by James Adam, was built in the following year, leaving the old Steeple an orphan. I mentioned the Merchant City district above. This building, called Merchant Square, is part of it. If you have a magnifying glass and good eyesight, you might be able to make out the date 1886 on the pediment. 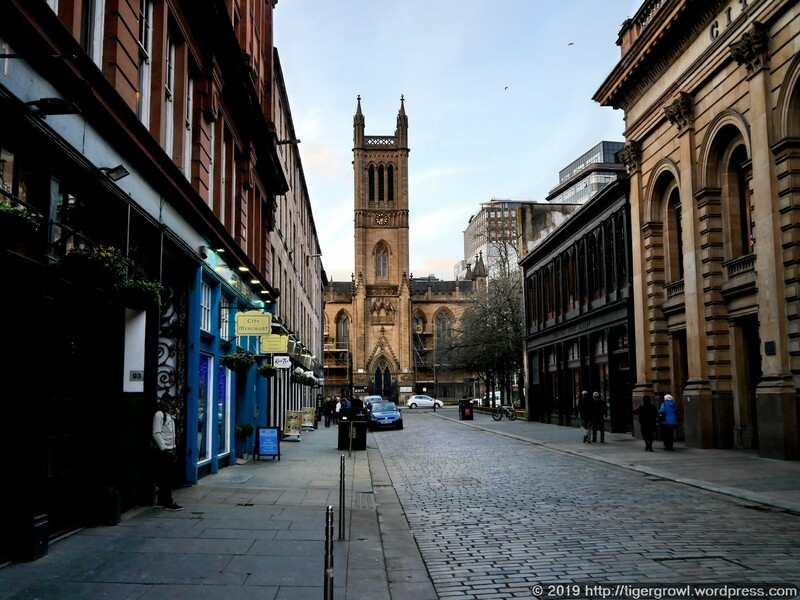 This view is along a street with the evocative name Candleriggs to the Church of St David, better known to Glaswegians as the Ramshorn Kirk. As for the name of the street, the first part is easy to explain: a candle maker’s business did once exist here. The word riggs is less easy to explain and I have so far not found an explanation of it unless the entry for rig(g) on this page in Scots Words and Place-Names provides a clue. Nor do I know how the church acquired the soubriquet Ramshorn. 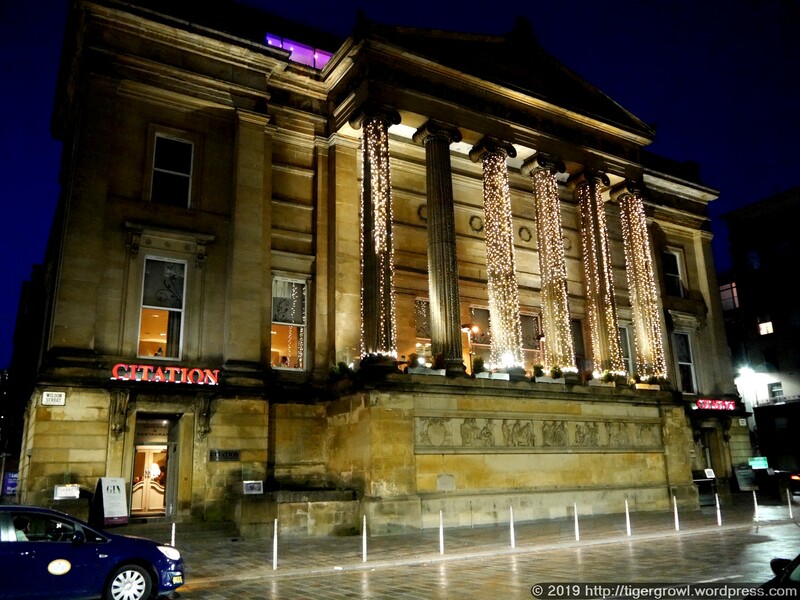 It was built in 1824-6 as the Church of St David but was sold in 1982 to Strathclyde University to serve as a home for its Strathclyde Theatre Group. In Wison Street stands this grandiose porticoed building. At present it is draped with lights, something that could never have occurred in the days of its more serious duties as the Sheriff Court. The sheriffs have moved on to a more modern venue, leaving their old home to be repurposed as a retail and residential block. My last photo before we headed back to the hotel shows a view along Glassford Street. The tower in the background belongs to a major building sited in St George’s Square. Built in 1888 to a design by William Young, it is the Glasgow City Chambers, home of the city council. We now made for Motel One and our temporary nest on the 9th floor where we rested in readiness for more adventures on the morrow..
Today’s outing takes us to two galleries, firstly, the fine Dulwich Picture Gallery and, secondly, the ever-challenging Saatchi Gallery. The map above shows our path, starting at upper right and ending at upper left. 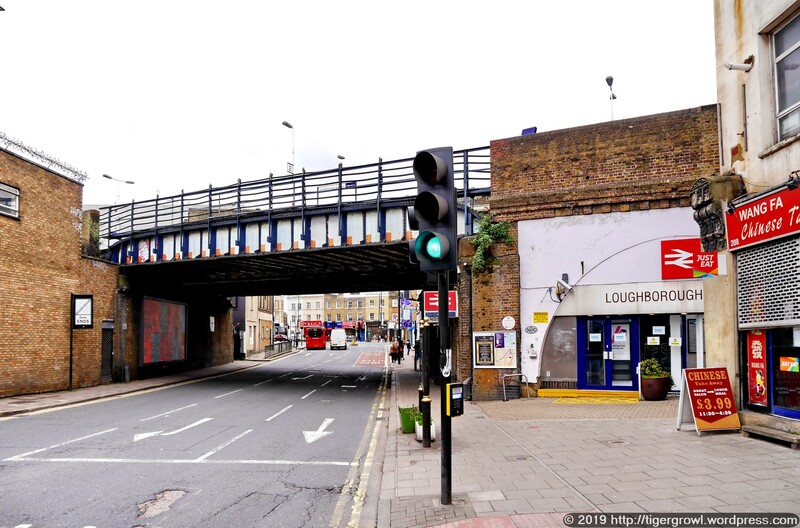 We performed the outward journey in two stages, first taking the train to Loughborough Junction. 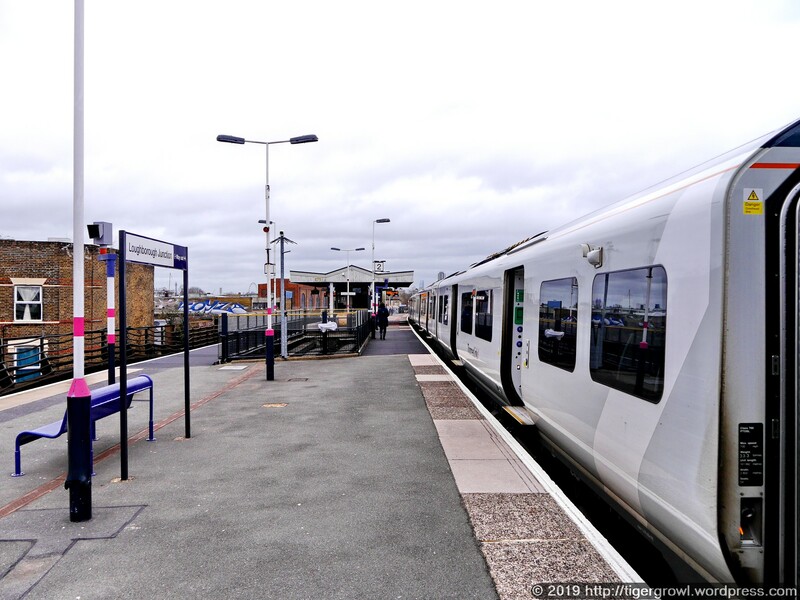 The name Loughborough sounds as though it might derive from Anglo-Saxon origins (as does the name of the town of Loughborough in Leicestershire) but it in fact goes back only as far as 1660 when Lord Loughborough bought the local manor. The manor is long gone (an hotel occupies the site) but the name lingers on. The railway line traverses this part of town on a viaduct and the platforms are therefore raised above street level, allowing views of the surroundings as this photo shows. After climbing down a flight of stairs, one reaches the entrance of the station which nestles shyly in a corner under the viaduct. Next, we took a bus to Dulwich Village where the first of our galleries is to be found. 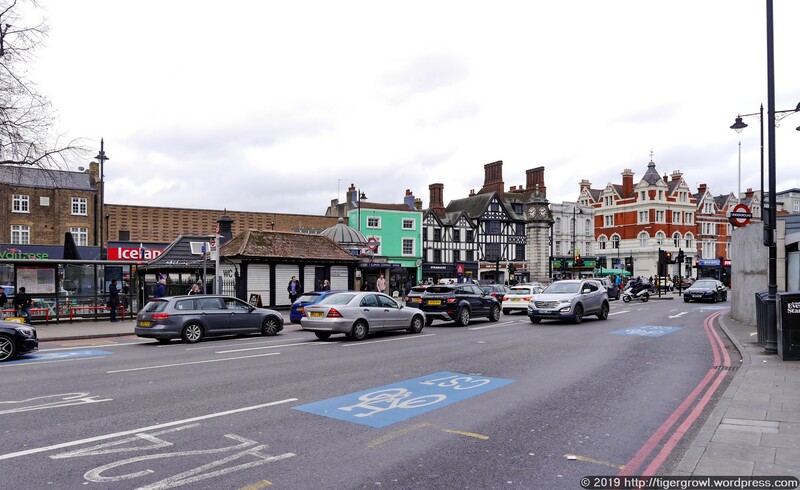 Dulwich is a pleasant neighbouhood with something of the feel of a rural market town. For an etymology of the name Dulwich see here. 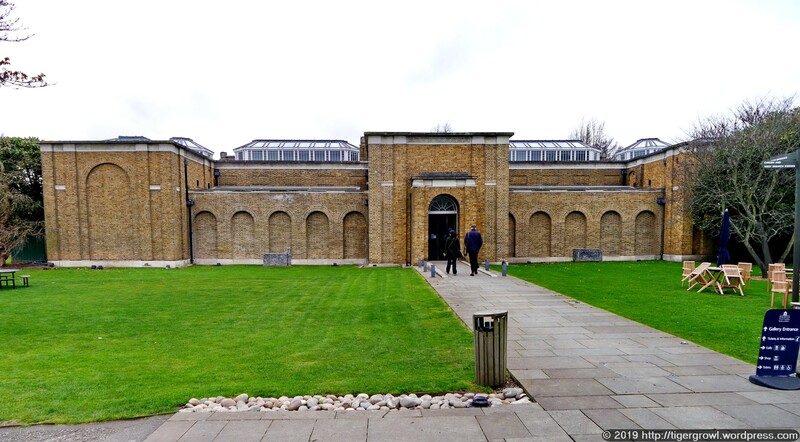 The Dulwich Picture Gallery has a permanent collection of artworks which are worth visiting from time to time on their own account but it also hosts special exhibitions. 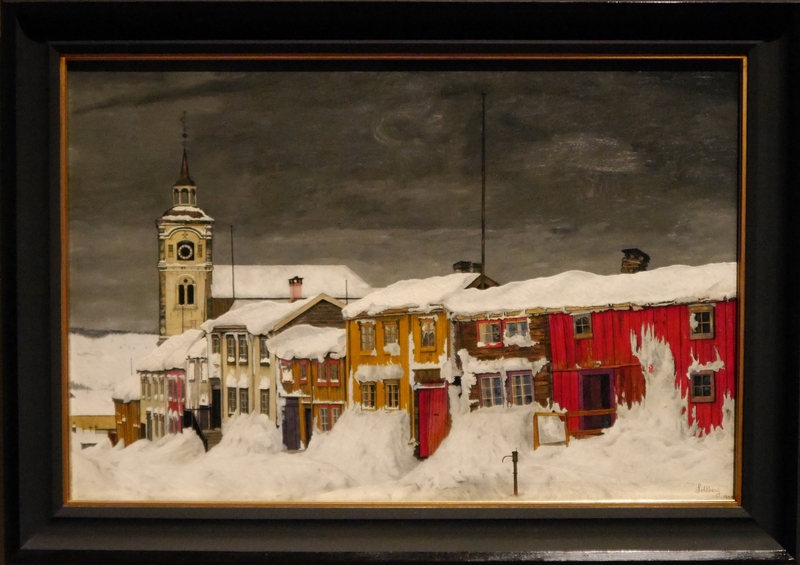 We had come to see one of these, entitled Harald Sohlberg: Painting Norway. 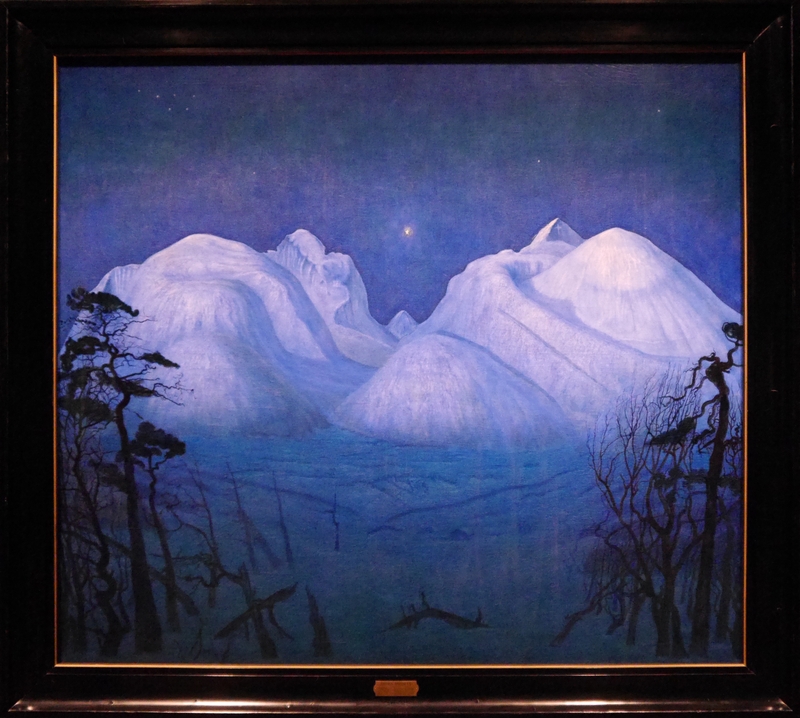 Harald Sohlberg, one of Norway’s greatest painters, created works that evoke the wilderness of the Nordic landscape, the softness of its flower fields and the harsh beauty of its winters. … With close to 100 works, we showcase the breadth and ambiguity of his paintings, and their enduring relevance in today’s world. My first reaction to the paintings and sketches was one of relief: these were figurative works that I could engage with and respond to, not abstract art whose long commentnaries in prose are often hard to associate with the actual object. Here we have streets, houses, forests, mountains and lakes, all very obviously what they are supposed to be but filtered through the artist’s emotion and stylized accordingly. The artist is in tune with his native land, Norway. Looking at some of his paintings, you could ‘almost be there’. 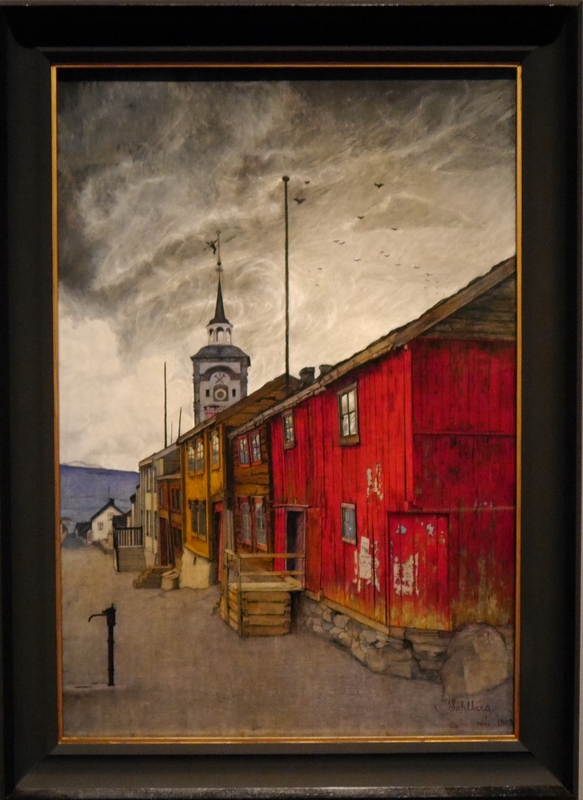 Sohlberg and his wife lived for a while in the town of Røros and it appears in many of his paintings. There is no snow here but the scene is dark as though it is evening on a dull day. It has been remarked that Sohlberg’s scenes are usually empty of people, though these may appear, as it were by implication, such as a light shining through a window on a wine glass left on a table. 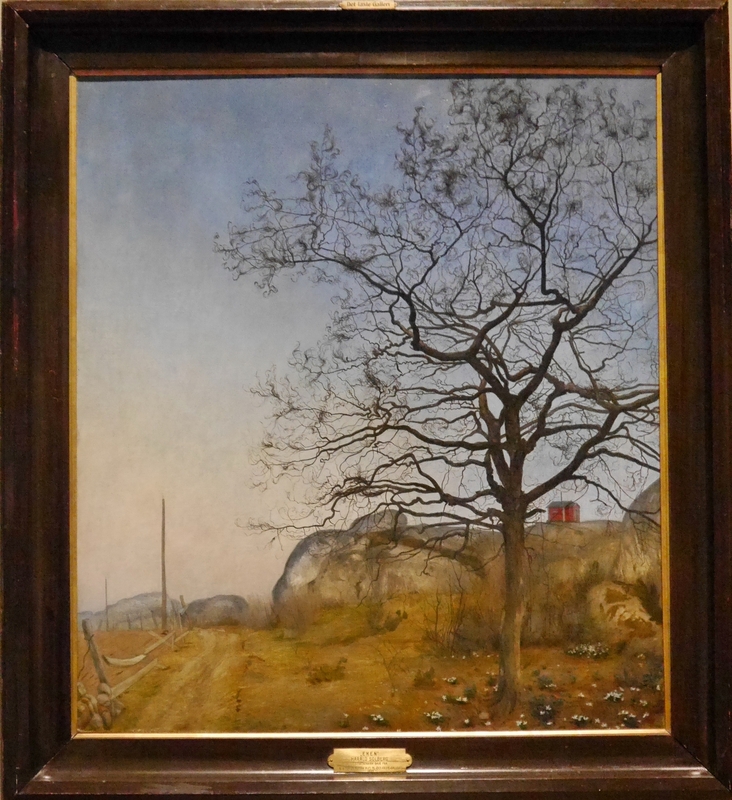 For some, this evinces a coldness but for the artist it was the land of Norway in all its aspects that was his primary interest and the inspiration of his works. Such reviews that I have seen (and here is one to be going on with) have been unreservedly positive, even lyrical, in their praise of Sohlberg and his works. 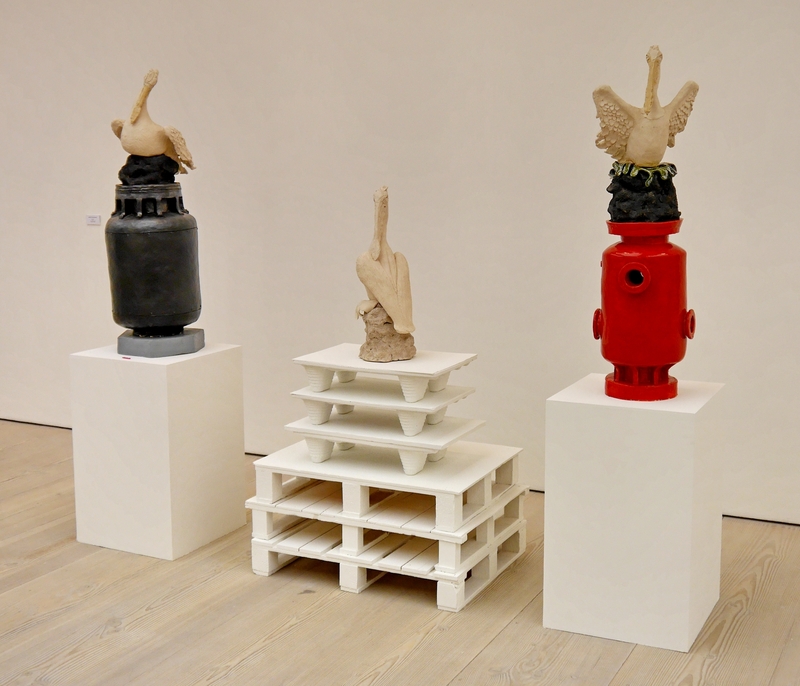 As I made my way through the exhibition, however, my own reactions were more nuanced. I felt that where the artist had succeeded, the paintings were very good but that there were cases where, to be frank, he had not succeeded, and those paintings I found rather inferior. I did not photograph any of those and in fact, I only photographed paintings that I thought would show up well in a photograph. Not all would do so, despite being perfectly good paintings in their own right, and there was no point in trying to capture them. This small selection is just that, a sample without any claim to being representative of the whole. 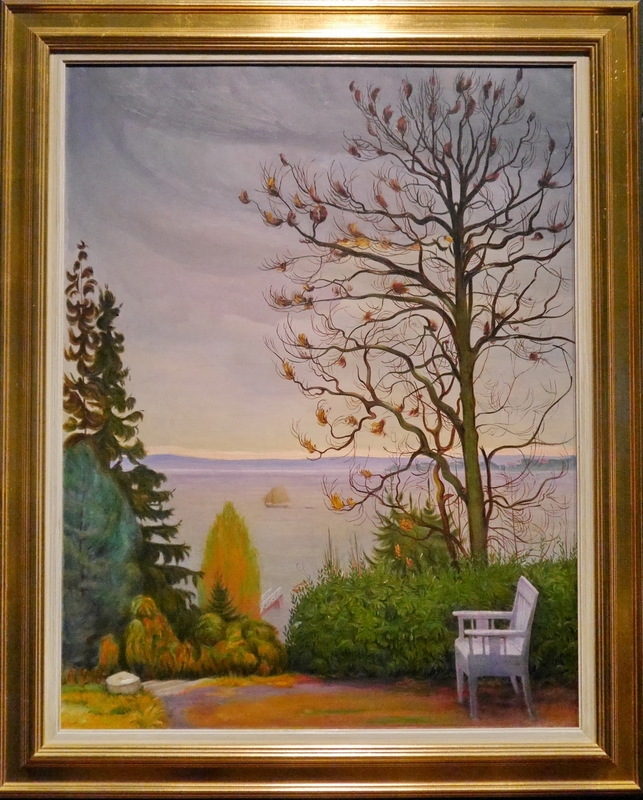 Painted in the last decade if his life, his stylization of trees has reached an extreme. The chair sits empty, emphasizing the human absence. Its rigidity is in contrast to the tumbling, organic, troll-like forms of the vegetation directly in front of it, not unlike his early painting Evening Glow, where he imagined the woman behind the bushes. This image is considered one of the most important of the artist’s works. I say ‘image’ because he made several versions in different media as well as preliminary studies during a period covering two decades or more. The scene represents snow-covered mountains in winter under a blue tinted dark sky and with bare trees in the foreground framing the view. Sohlberg considered it his most significant work in which all the elements of his style came together in successful fusion. 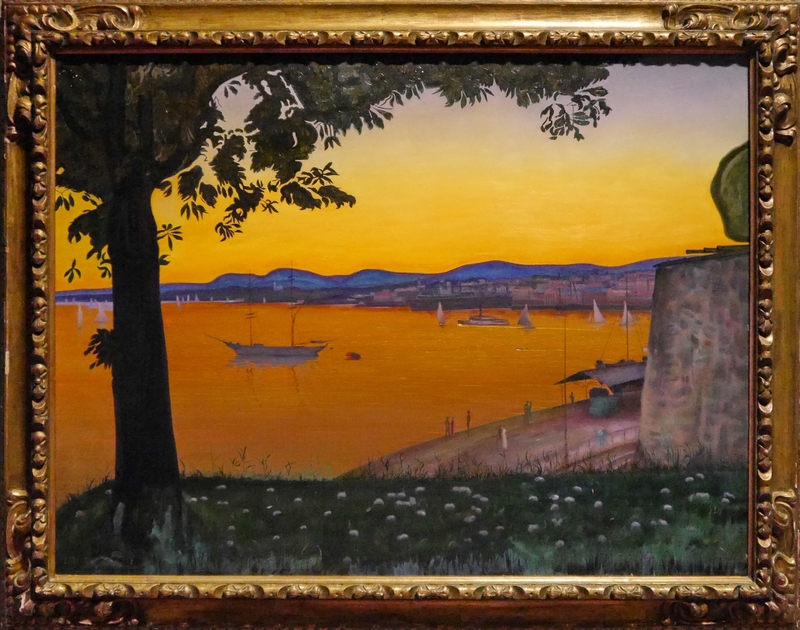 The version shown here is an oil painting of 1914. At one side of the Picture Gallery is a space or room known as the Mausoleum, a mysterious place illuminated by a window with coloured glass. This space is currently inhabited by a work of art specially commissioned to accompany the Sohlberg exhibition. The work is by Mariele Neudecker and is entitled Breathing Yellow. 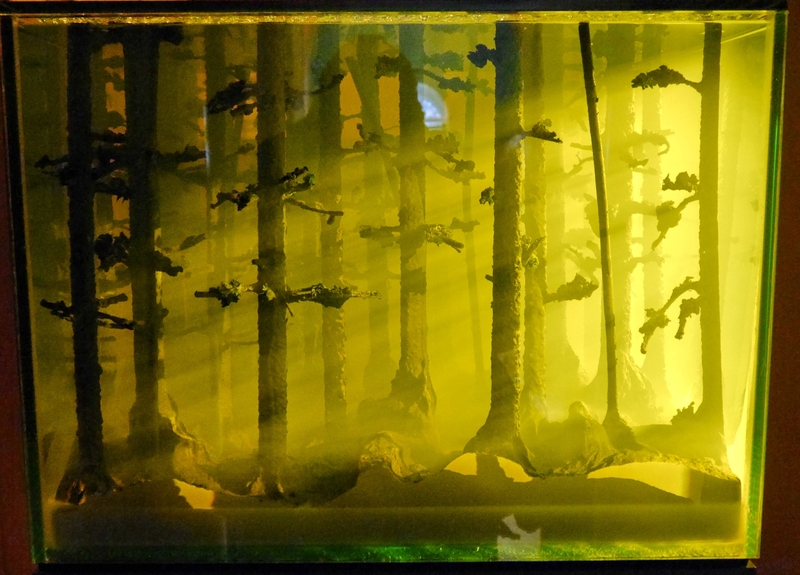 Breathing Yellow consists of a transparent tank in which has been installed a miniature but realistic model of a section of forest. A thin mist permeates the forest, making visible the slanting rays of light projected onto it by the window. If the yellow colour of the light is unnatural, one soon forgets this and the mind, I suppose, identifies it with sunlight. I was captivated by the realism of the scene. The effect is created by filling the space in the model, not with air, but with a special liquid. This is not obvious when we look at the scene and the illusion was, to my eyes, perfect. Attached to the gallery is a large and beautiful garden. 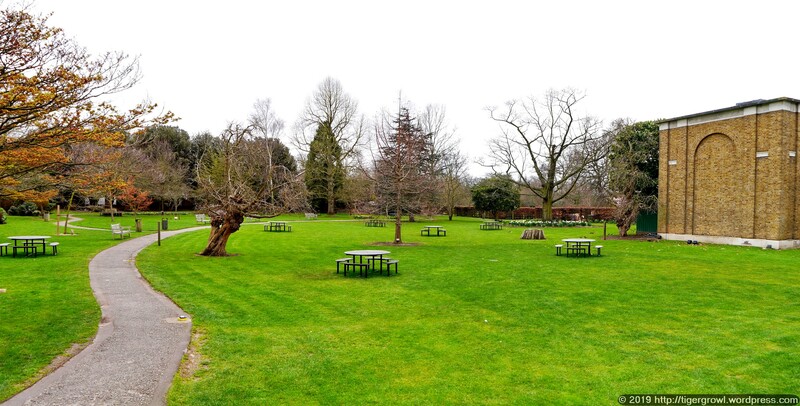 In fine weather, the garden is usually busy with people strolling and sitting but today it was virtually deserted. This provided the opportunity to photograph it and make a picture, like those of Sohlberg, empty of people! After viewing the exhibition, we went to the nearbu bus stop to catch a bus for the next stage of our journey. 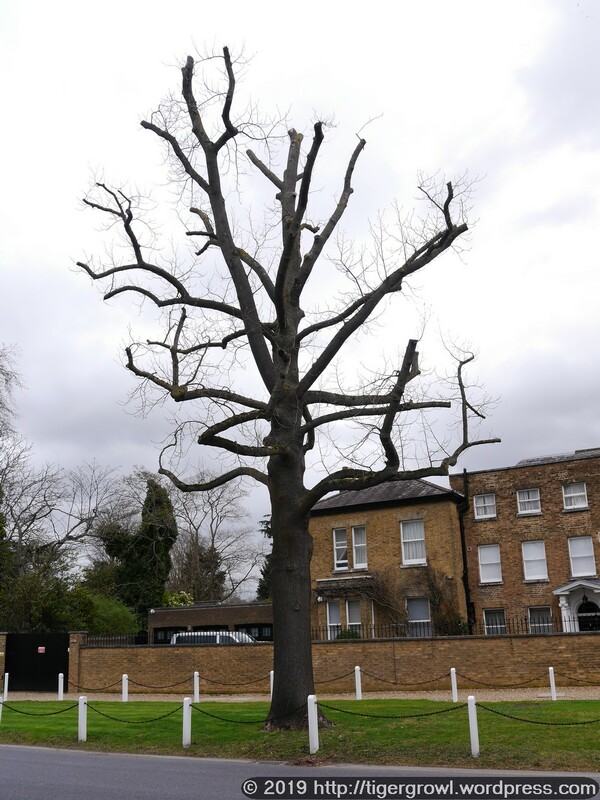 Opposite was this tree, closely prouned and devoid of leaves. It seemed entrapped in silent stillness, waiting for the spring to come and release new life into it with the bursting out of fresh foliage. We changed buses in Clapham Common and had a late lunch in the local branch of the tapas bar chain Jamón Jamón. 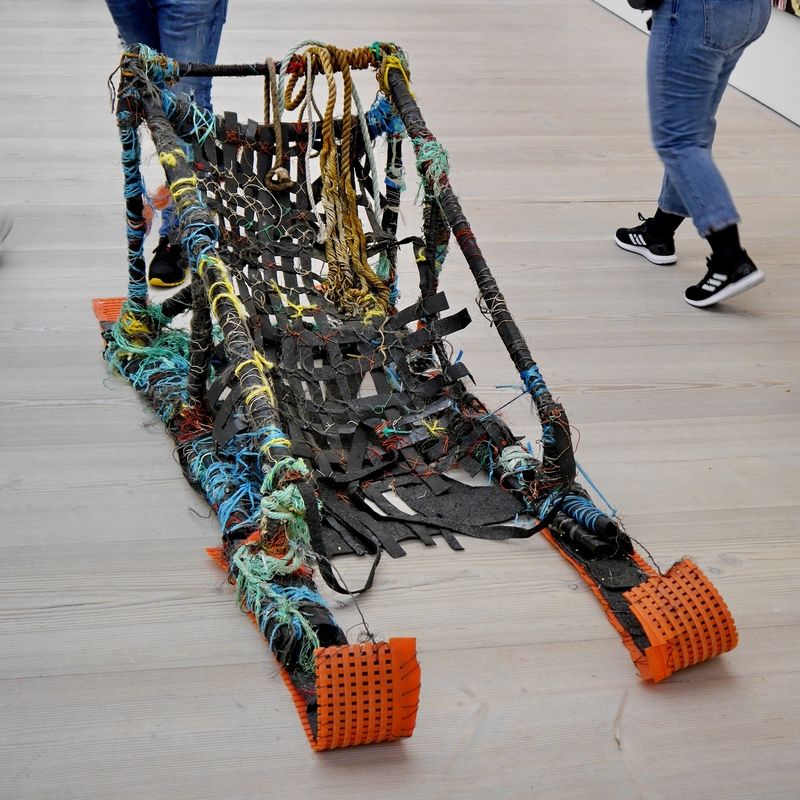 Then we took a bus that delivered us to Sloane Square and the Saatchi Gallery. There were several exhibitions on show and the gallery was quite crowded. As usual, I more or less ignored the exhibitions and simply waited to see which works caught my attention.I have chosen three to show you. All of them are accompanied by the note ‘Dimensions Variable’. 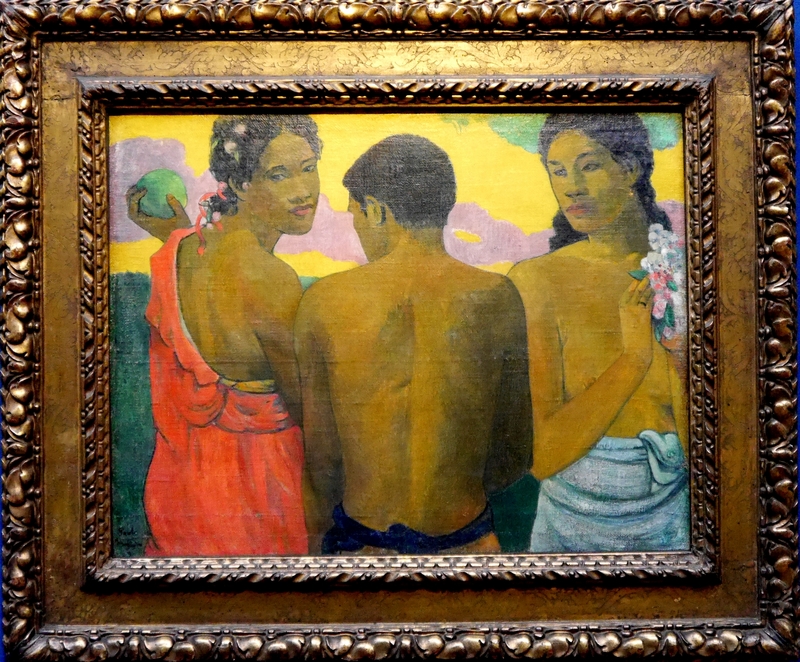 If we are habituated to thinking of artworks as fixed in shape and size, like a painting or a sculpture, then the idea that a work may appear in a different configuration on different occasions will seem strange but some works lend themselves to this and may gain from surprising us with a different shape. 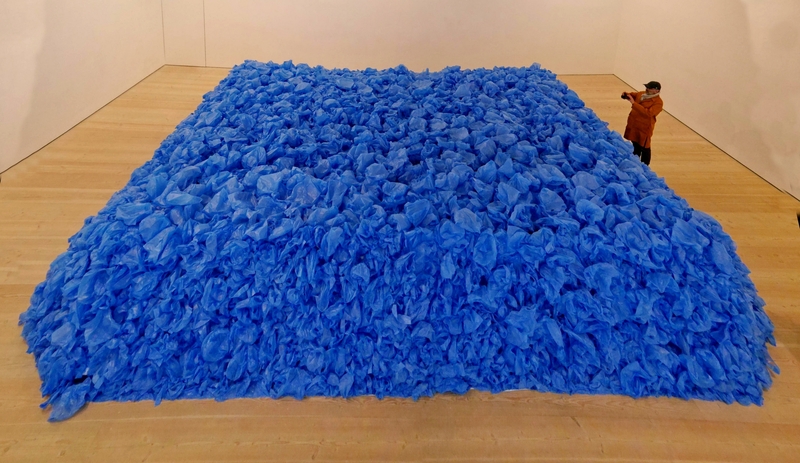 This large scale installatiion, entitled Tout doit disparaître/Everything Must Go by Jean-François Boclé, consists of I-know-not-how-many blue plastic bags filled with I-know-not-what. 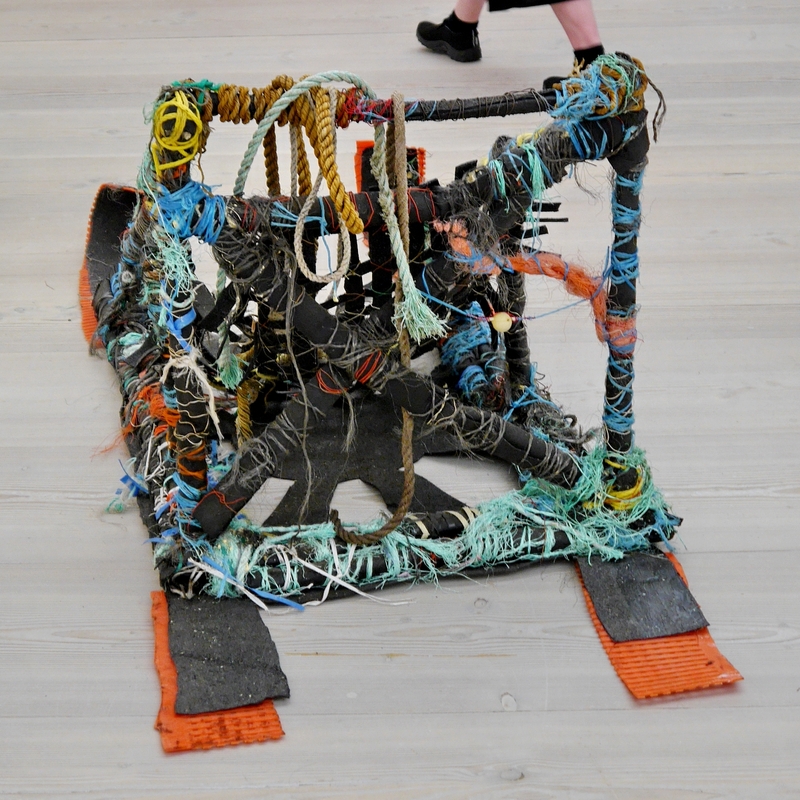 I have seen and photographed it twice before (see Some art from the Saatchi Gallery and A quick visit to the Saatchi). On those occasions, I saw and photographed it from ground level but this time I could view it looking down from a balcony, providing a new perspective. The size of the installatiion can be seen in contrast with the man standing beside it photographing it. 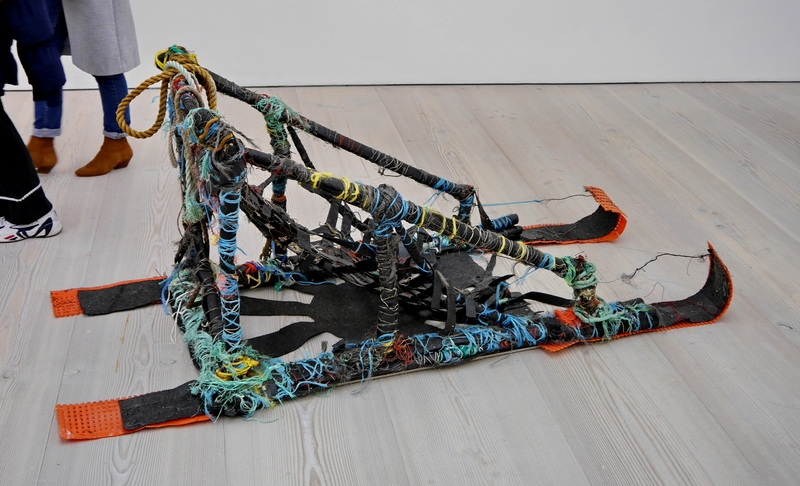 The Saatchi possesses a number of works which reappear from time to time and this is one of them. For once, Saatchi offers no guidance on this exhibit. 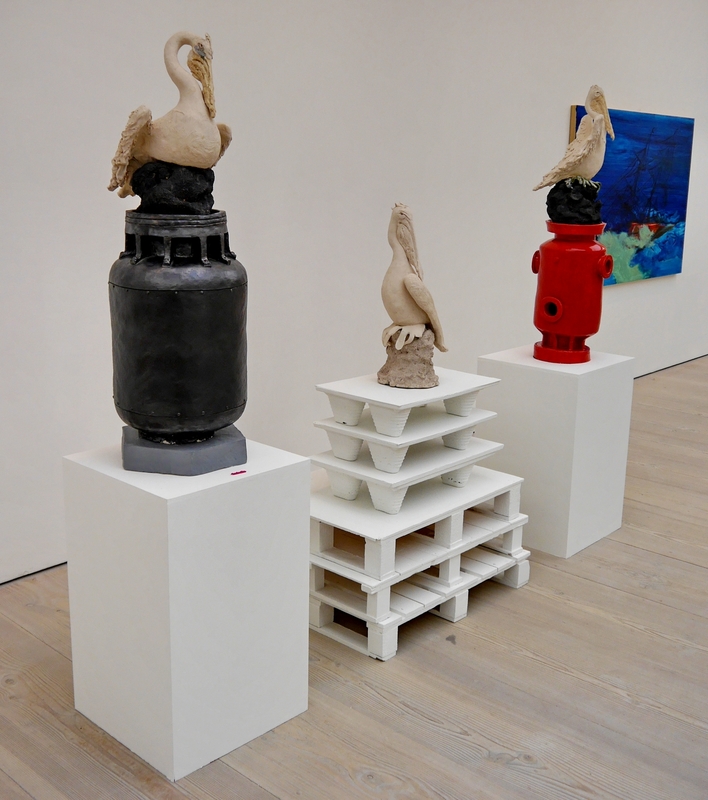 By Benedetto Pietromarchi and entitled Pelican Bay, is it a sculpture, an installation or both? As it too is slated ‘Dimensions Variable’, I think we can take it that it is an installation that can be arranged in different ways. 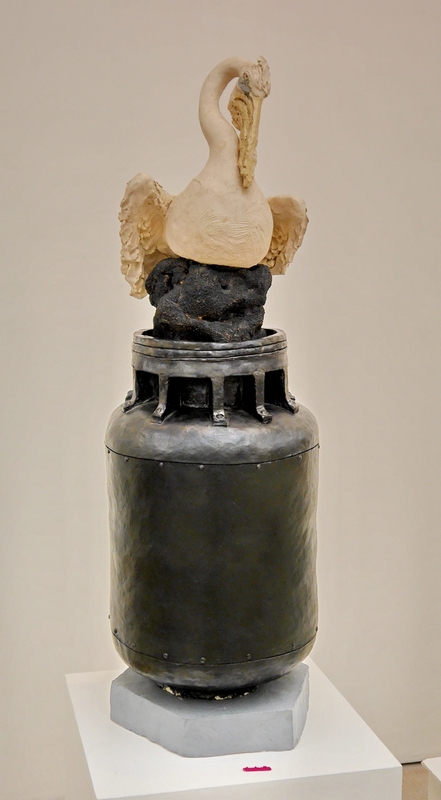 A work by this artist was included in Sculpture in the City in 2016. You can see that work, entitled Of Saints and Sailors, in my post Sculpture in the City 2016 or on this page.